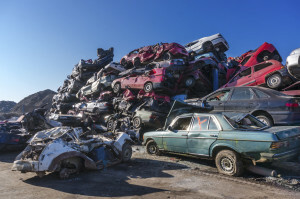 The true history of more than 30,000 seriously damaged or total-loss vehicles for sale in Indiana and Illinois was being obscured, experts told a WLS investigative team. Experts showed the reporters how the car’s condition was hidden from buyers through erased odometers, missing information and phony titles. The station published their report Tuesday. “And they actually folded this document back and forth and rubbed it and you can see they removed the ‘salvaged’,” Sgt. Elmer Garza of the Illinois Secretary of State told the station. A CARFAX staffer told WLS that scammers would alter a title from a car in one state and sell it in another state. Sometimes, you don’t even need to alter it — damage from one state might not even show up on another state’s title, the team found. Besides checking a source like CARFAX, a simple Googling of a VIN number could produce the truth in some cases. Illinois law lets you advertise a car without revealing its condition until the sale is done, making it easier to fool a buyer. WLS’ coverage did note the potential for a skilled collision repairer to rebuild a car, cautioning not everyone could do it. “The parts, the labor, the knowledge that you need to rebuild today’s cars – I wouldn’t put my family in a car that had a salvage title. Not on your life,” auto expert Greg Jacobi told the station. Cheshire County crime Commissioner John Dwyer was slated to appear on the BBC show “Inside Out: North West” on Monday, the Chester Chronicle reported that day. He said that Category B vehicles which “should be crushed” are available “on many online auction sites and sold second hand,” the Chronicle said. The Chronicle reported that Dwyer also put in a plug for professional collision repair.